We believe that the future of work is one of the most important lenses through which to look at the future. The current pace of change in the nature and structure of work is exceptional, and we all need to understand the shifts so we can respond effectively. Companies will need to address rapidly changing customer needs. Organizations will need to reshape their workplaces, work practices, and way in which they engage and retain talent both inside and outside. Governments will need to deal with a potentially radically different economic structure as well as effectively manage their own workforce. Cities will need to reshape priorities to attract the best work and most talented people. Societies will need to adjust to major shifts in personal and societal roles. Individuals will need to plan for dramatic change in the world of work for themselves and their children, impacting livelihoods and identity. Humanity will be shaped and possibly divided as the nature and value of work evolves. 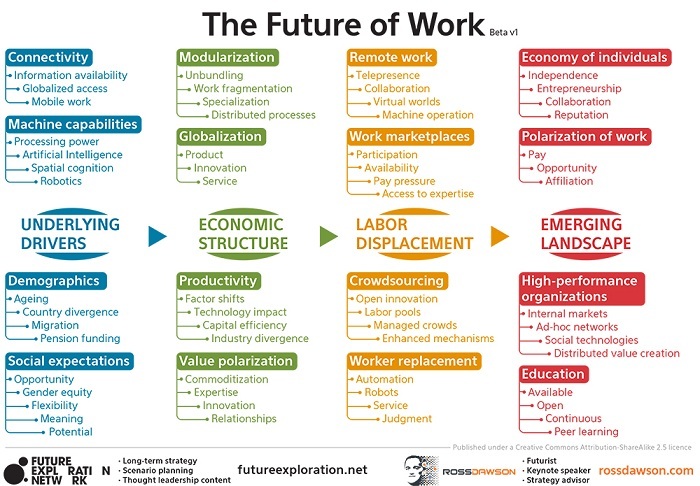 Our Future of Work Framework below (currently in Beta version 1) is designed to provide a high-level overview of how the landscape of work is changing. We have used this framework with a number of client organizations to explore the space and begin to drill down into specific areas of interest. We have also created a number of customized frameworks for clients that focus on their strategic priorities, such as creating successful organizations, designing effective workspaces, and shaping educational initiatives. We work with clients in a wide variety of ways to assist them to seize the emerging opportunities as work changes. For limited engagements, Board and executive briefings provide a concise overview of critical issues, leading to discussion and identification of priority issues. Organizations that are planning or involved in workforce transformation find that assistance including organization-specific analysis, custom strategic frameworks and thought leadership content maximizes the value of their projects. Please get in touch if you’d like to discuss how we can help your organization succeed as the world of work is transformed in coming years.